Originally published under the title, "Christian Slaughter in Libya." 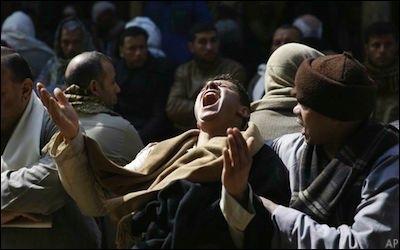 Egyptian copts mourn the slaughter of their coreligionists in Libya. The disputed fate of the 21 Coptic Christians abducted in Sirte, Libya is now clear and visible for all to see on video: while holding them down, Islamic State members shove their fingers in the Christians' eyes, crane their heads back, and slice away at their throats with knives—all in the name of Allah and Islam, all as the slaughtered call out on the "Lord Jesus Christ." Oh people, recently you have seen us on the hills of as-Sham and Dabiq's plain [Syrian regions], chopping off the heads that have been carrying the cross for a long time. And today, we are on the south of Rome, on the land of Islam, Libya, sending another message. He adds: "We will fight you until Christ descends, breaks the cross and kills the pig" (all eschatological actions ascribed to the Muslim "Christ," Isa). As opposed to the Obama administration's reactions to Islamic State beheadings of Americans and others—namely, strong assertions that such actions are not Islamic—Egyptian President Sisi responded to the slaughter of Egyptian citizens by immediately sending fighter jets to bomb Islamic State targets in Libya. The Islamic State is calling on Muslims to find and slaughter more Coptic Christians. What did these Coptic Christians—or, as the Islamic State refers to them, "The Humiliated Followers of the Coptic Church"—do to deserve such treatment? According to Catholic Pope Francis, "They were killed simply for the fact that they were Christians. It makes no difference whether they be Catholics, Orthodox, Copts or Protestants. They are Christians!" In its online English magazine Dabiq, after justifying the slaughter of the 21, the Islamic State concludes that "it is important for Muslims everywhere to know that there is no doubt in the great reward to be found on Judgment Day for those who spill the blood of these Coptic crusaders wherever they may be found." And indeed, spilling Coptic Christian blood in Libya—and being rewarded for it—has been ongoing for some time now. This most recent beheading, which received a decent amount of media attention, is only the latest in a long line of Muslim persecution of Christians in Libya. A few days before the 21 Christians were abducted (in two separate incidents), a Christian father, mother, and young daughter were slaughtered in the same region, Sirte. On December 23, Islamic militants raided the Christian household, killing the father and mother (a doctor and pharmacist, respectively) and kidnapping 13-year-old Katherine. Days later, the girl's body was found in the Libyan desert—shot three times, twice in the head, once in the back (graphic images here). Anti-Christian atrocities were unheard of under Moammar Gaddafi's authoritarian rule. Nothing was stolen from the household, even though money and jewelry were out in the open. According to the girl's uncle, the motive was that "they are a Christian family—persecuted." In short, as I wrote nearly a year ago, it continues to be "open season on Christians in Libya." Last February 2014, after Ansar al-Sharia—the "Supporters of Islamic Law," now an Islamic State branch—offered a reward to any Benghazi resident who helped round up and execute the nation's Coptic residents, seven Christians were forcibly seized from their homes by "unknown gunmen," marched out into the desert and shot execution style 20 miles west of Benghazi (graphic pictures appear here). Days later, another 24-year-old Coptic Christian was shot in the head by "unknown gunmen" while unloading food in front of his grocery stand in Benghazi. On the next day a corpse was found, believed to be that of yet another Copt—due to the small cross tattooed on his wrist traditionally worn by Egyptian Christians. Needless to say, such atrocities were unheard of under Gaddafi's "authoritarian" rule (just as they were unheard of in Saddam Hussein's Iraq, just as they were unheard of in Syrian regions formerly under Bashar Assad, etc.). Muslim slaughter of Christians is the litmus test of how "radical" an Islamic society has become. In every single Mideast nation where the U.S. and its Western allies have interfered—Iraq, Egypt (under Morsi), Libya, and ongoing Syria—the slaughter of Christians there is a reflection of the empowerment of forces hostile to everything Western civilization once stood for. It also means that the barbarous Islamic State—far from waning and being limited to portions of Iraq and Syria—is growing stronger, now well entrenched in Libya too.